1. Extend your arm in front of your body bending your elbow at a ninety degree angle to your body so that your forearm is parallel to your body. 2. Keep your fingers straight and turn the inside of your wrist towards your body. 3. Place your thumb and index finger on the two prominent bones on either side of your elbow, then measure the distance between the bones with a tape measure or calipers. 4. 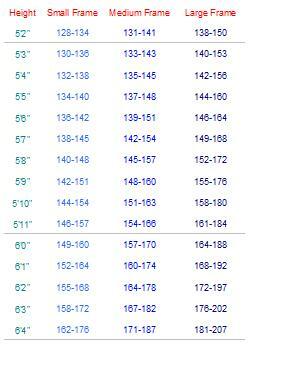 Compare to the chart below. 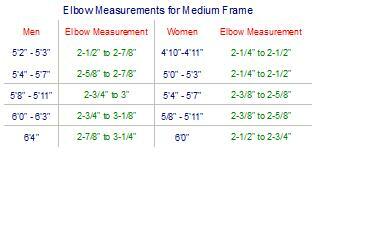 The chart lists elbow measurements for a medium frame - if your elbow measurement for that particular height is less than the number of inches listed, you are a small frame - if your elbow measurement for that particular height is more than the number of inches listed, your are a large frame.